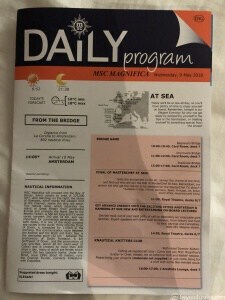 Today is our third sea day on this cruise. We have a total of five sea days and they are nicely spread out throughout our voyage. 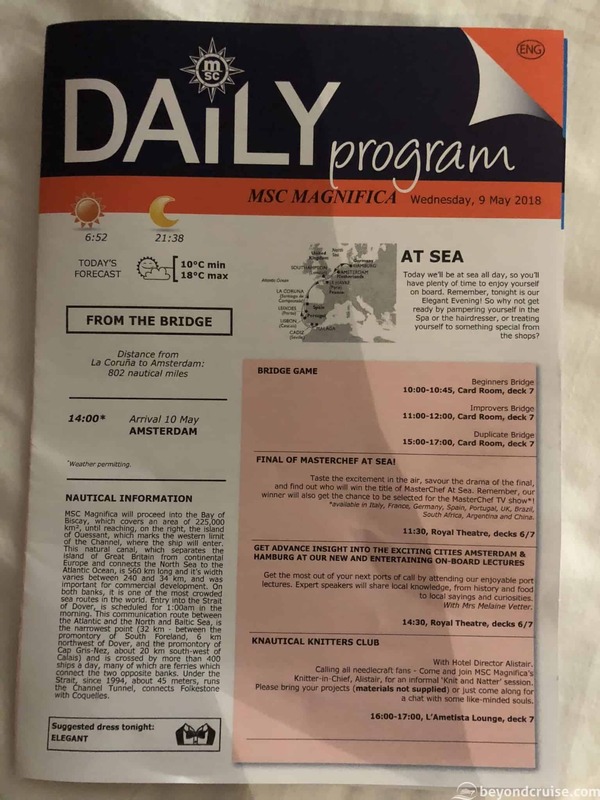 We are continuing our sail from La Coruna, Spain last night towards Amsterdam, which we are due to arrive at around 2pm tomorrow. We are going to spend the majority of today in the English Channel and will be passing through the Dover Straits at around 1am. The journey is a hefty 802 nautical miles for this leg. 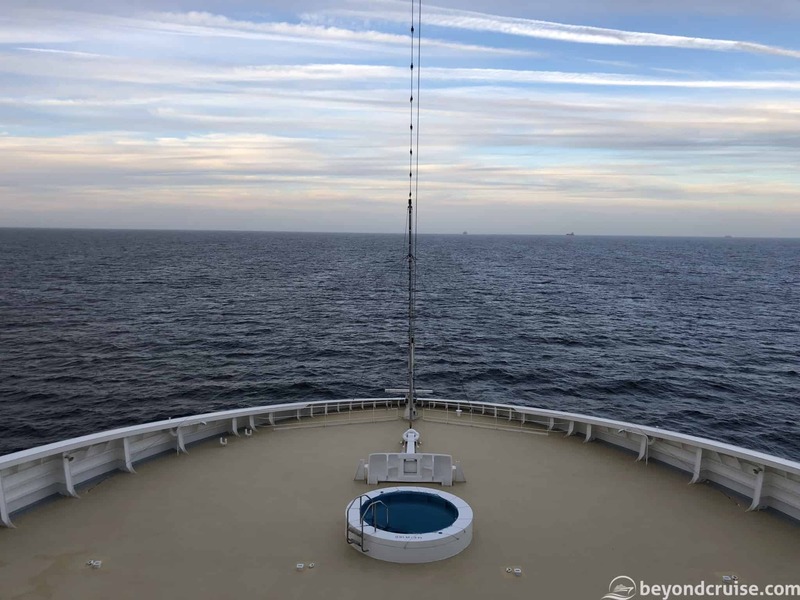 We awoke around 10am with some confusion, as various devices of ours in the cabin switched to Portuguese time (basically GMT+1) as we sailed past and others have stayed on ship time (GMT+2) – thankfully we had nothing to attend to this morning! We got ready and headed to the Sahara for breakfast – fruit juices, fruit and some assorted pastries. Then we headed to the front of the ship to the Royal Theatre, Deck 7. 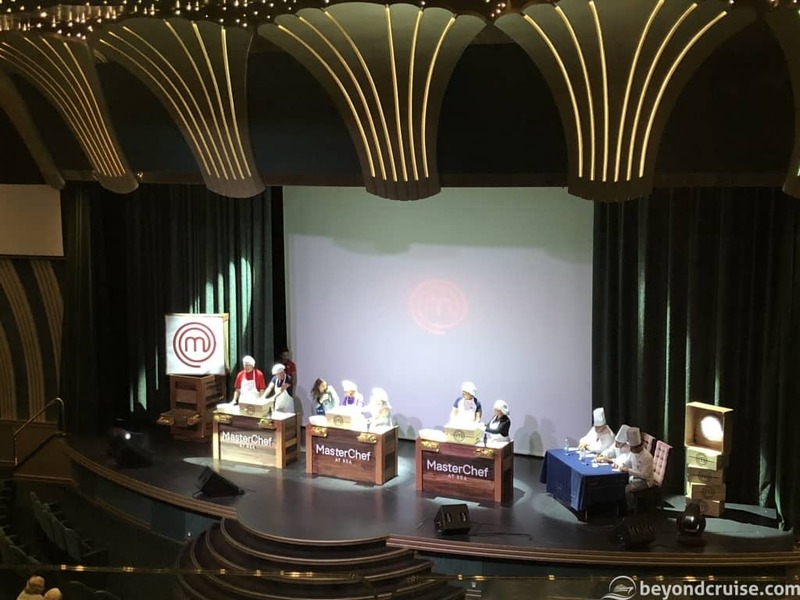 Today is the final of the Masterchef at Sea competition that MSC Cruises‘ runs on the majority of their ships. It is interesting to see the brand crossovers between shore-based establishments and brands. It is nice to see the only brand MSC Cruises’ carries across on this ship is the popular global cooking show. There were three pairs of contestants in the final and they were all up on stage awaiting their final challenge. They were tasked with making a simple attractive dish with an assortment of ingredients from their mystery boxes. 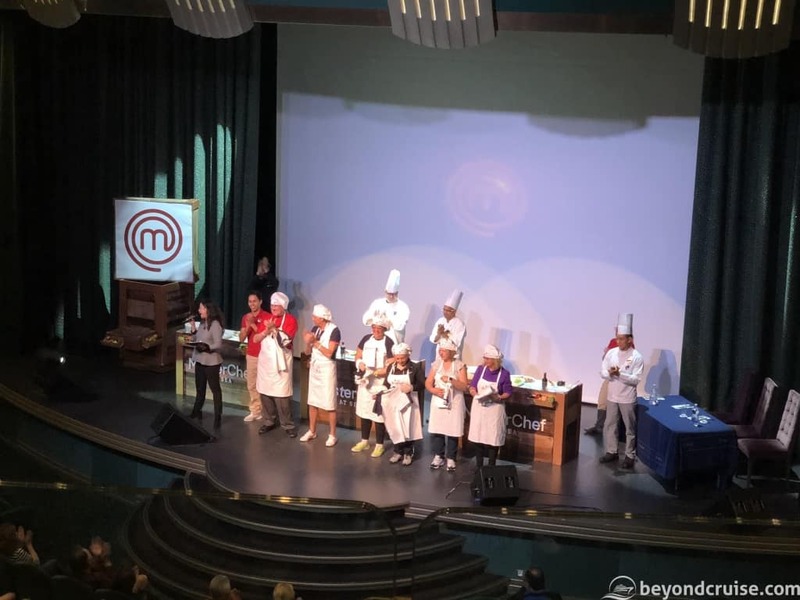 Not as easy as it sounds and additionally, it was to be judged by MSC Magnifica’s Executive Chef and two of his brigade. 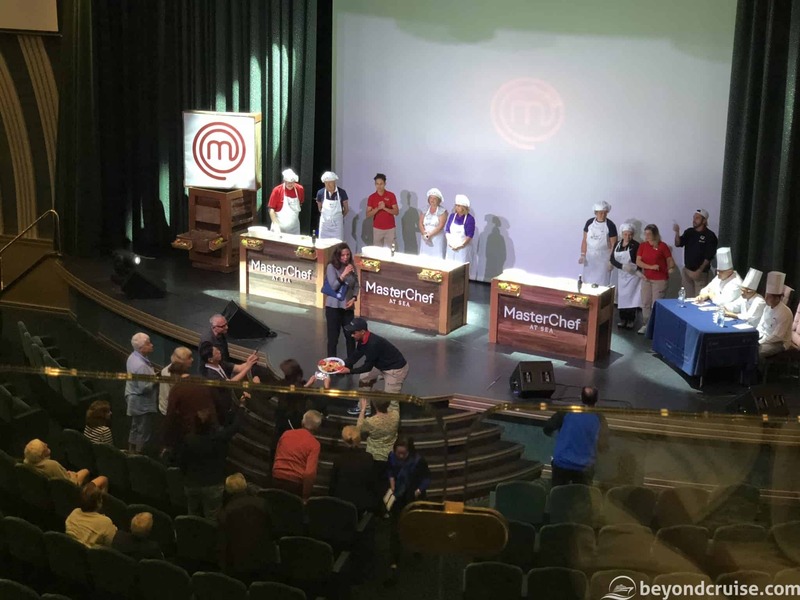 The winner of the competition wins some MSC Cruises goodies and are entered into the Masterchef Amateur cooking auditions in whichever country they live in. 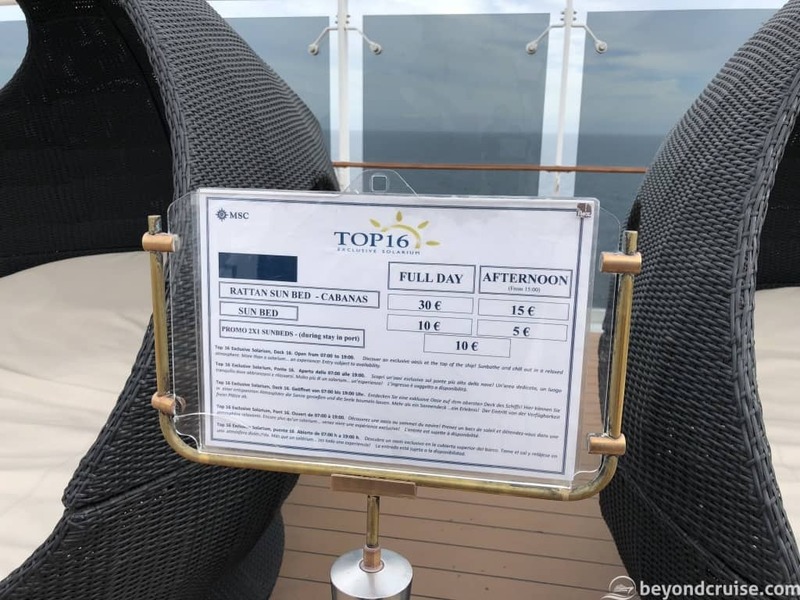 After the theatre, we decided to visit Top 16 – the Exclusive Solarium on Deck 16 of MSC Magnifica. Unfortunately for us, the weather wasn’t in our favour and it was too cold to lounge around and take a dip in the hydromassage pools. So instead, we opted for a Long Island Ice Tea cocktail each at the bar and then went for a little explore. 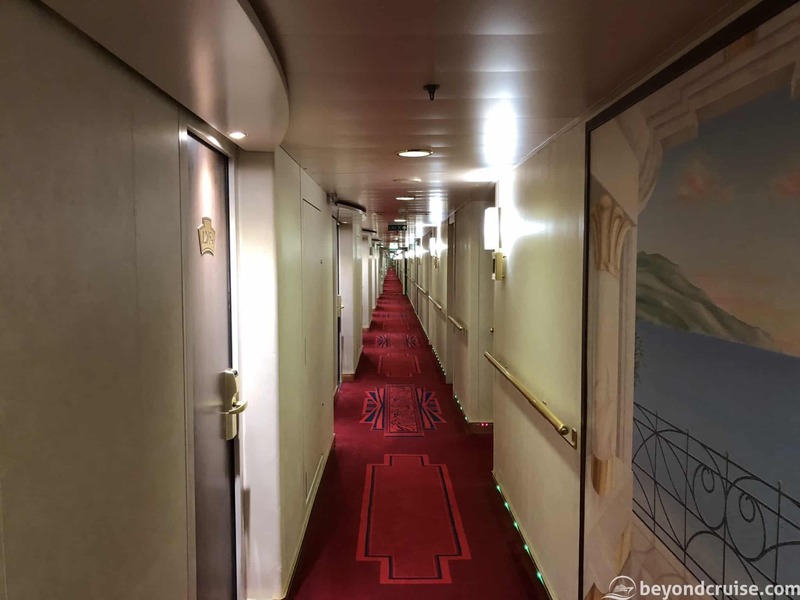 After endless corridors, we managed to walk nearly a full lap of the ship internally. We came across many other cabin steward/esses for each deck. By now, of course, they are familiar with their passengers that they have been looking after for the last ten days, so to see new faces they each asked “Are you lost? Can I help?” – it always amazes me how cruise ship crew can remember what you drink and what you like after just a few visits during the cruise. 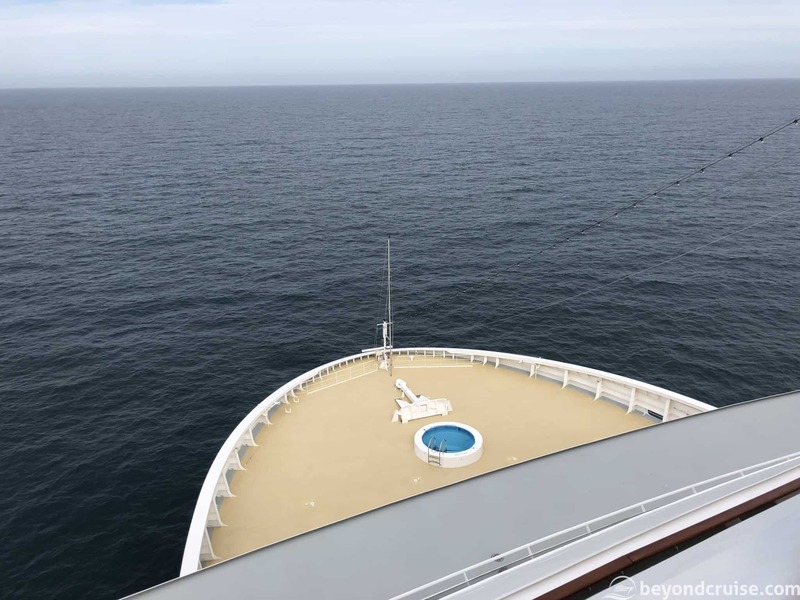 Eventually, we appeared out in the fresh air at the front of the ship on the Deck 15 viewing balcony. 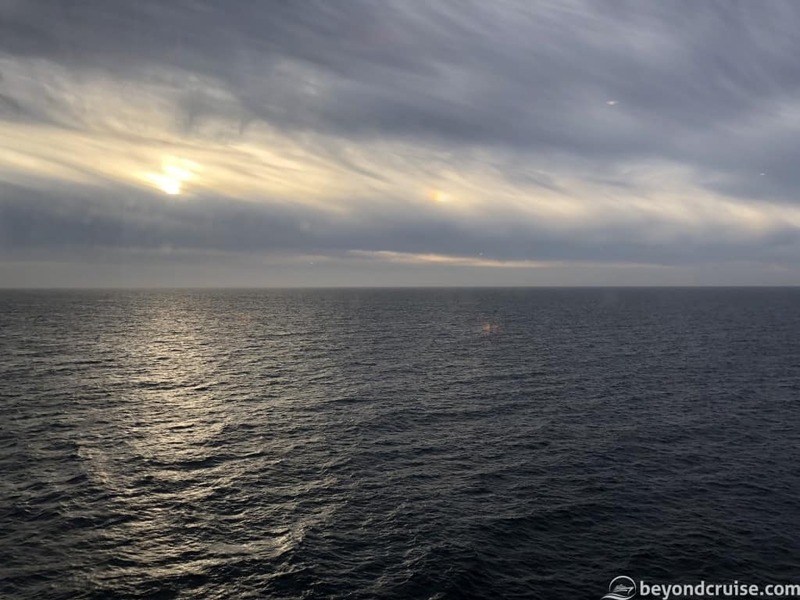 It was quite a surprise, not because of where we were but for the fact that the air was actually motionless – it was like we were alongside in a port! No breeze, nothing! 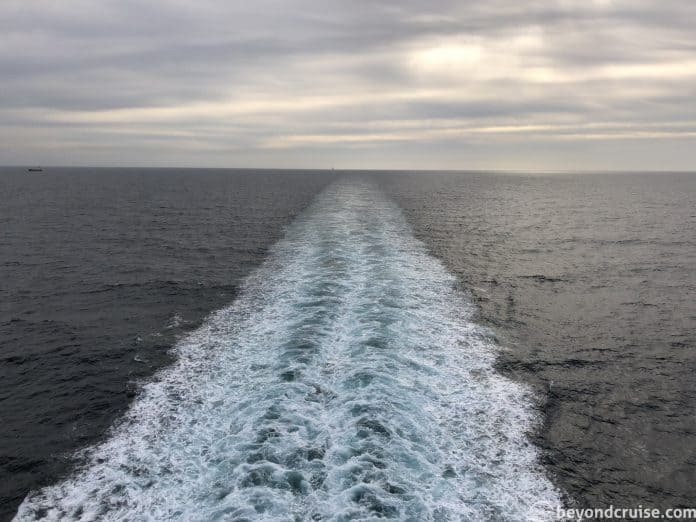 Of all places, we didn’t expect this type of perfectly calm weather in the English Channel. 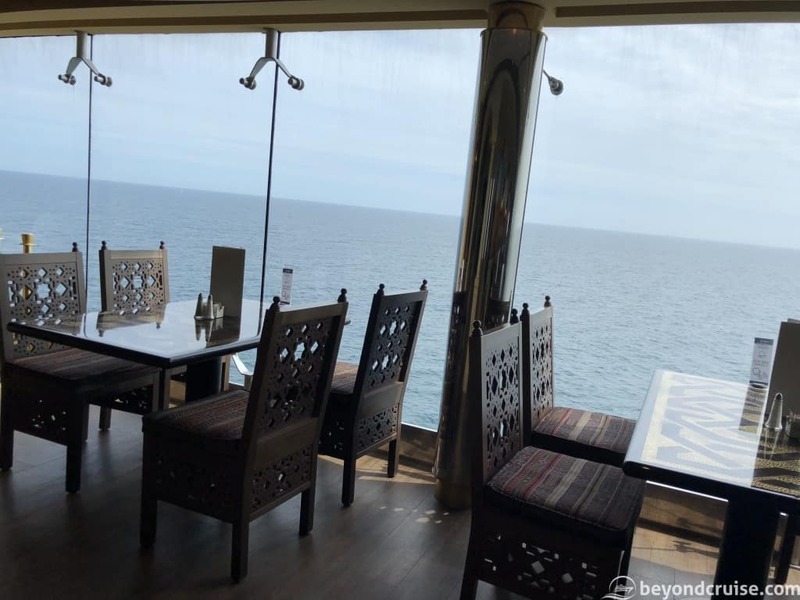 As we were so high up we couldn’t even hear the water breaking on the ship’s bow – it was eerily silent apart from the low volume piped classical music coming from the outside speakers. Dinner was good – we were alone again. Nevermind, at least we aren’t waiting for others to choose what they want! I had the Beef consomme to start and Sara had the Caesar salad. For our mains, Sara had the Squid ink tortelloni pasta, stuffed with salmon and I had the Duck à l’orange. Both were perfectly done – we skipped dessert as we wanted to get to the theatre for the show! Tonight’s show was Sophisticats in the Royal Theatre on Decks 6/7. We sat on the upper tier on Deck 7 for a change and the views are really good. The design is well thought out and there aren’t many (if any!) seats that don’t have a good view (we were 3 rows back and could see the full stage with ease). The show lasted approximately 50 minutes and included many dance routines and several pairs of acrobats and contortionists. 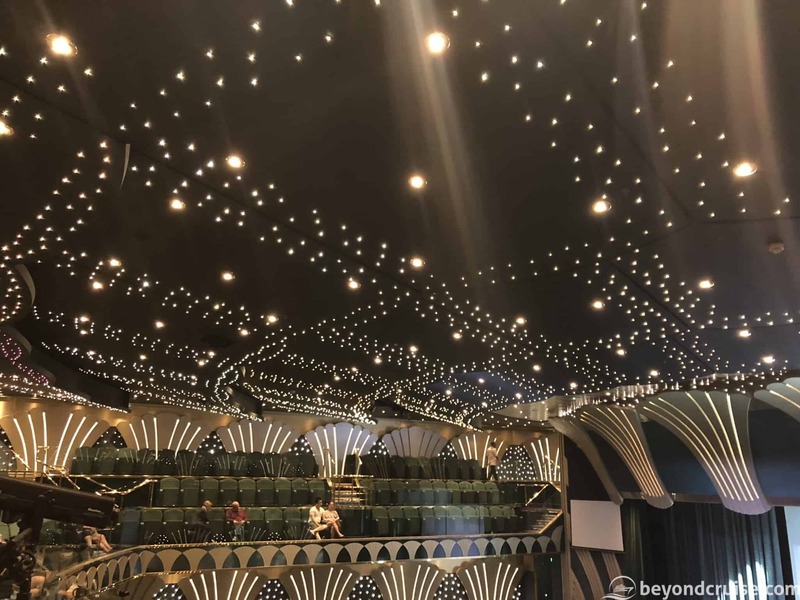 To be honest, from someone who has seen many Cirque du Soleil shows the acts were extremely good – especially for a cruise ship at sea too! 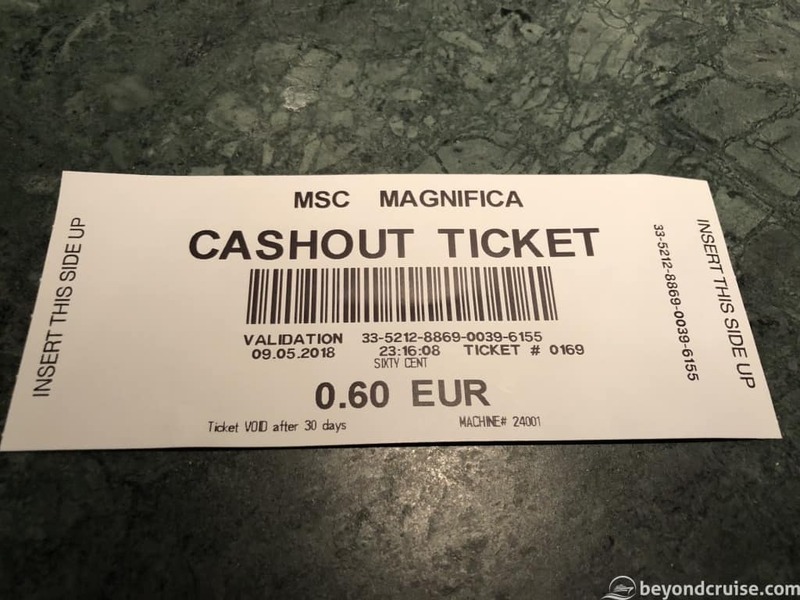 After dinner we popped by the casino – tried out the slot machines and took out our massive winnings whilst we were ahead (see below) and then before heading to our cabin, we visited Deck 11 forward balcony for a quick peek of the South Coast of the UK on one side and the North Coast of France on the other – pretty cool! (Though the Strait of Gibraltar wins for me). Now it is time to retire to bed, we’re up early to catch the sail into the locks at IJmuiden which we’ll pass through before sailing the 20km into the city of Amsterdam – if you have never experienced this, you must!